I always have it in view on my desk. 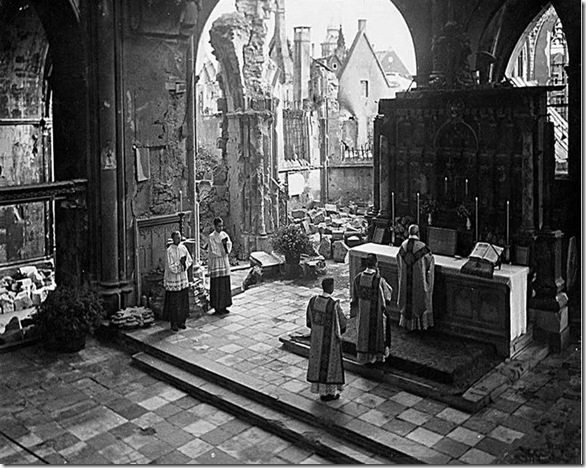 It is a black and white picture of a church interior badly damaged by bombs; massive columns still bear a vaulted ceiling but the rear wall of the church is completely collapsed, providing a view of a burnt-out neighborhood lying in ruins. The piles of stone almost penetrate the interior of the church. But the chessboard floor around the altar has been cleared. Three clerics are standing behind one another in a row on the altar steps wearing the large chasubles and dalmatics of the modern “Beuron” style. The open mass book is on the right side of the altar; we can see by the position of the celebrants that they are at the Kyrie at the beginning of the Mass. To one side, in front of a column damaged by bomb fragments, stands the credence table, flanked right and left by two adult acolytes in cassocks and rochets. The congregation is not visible; it must have been quite a distance from the altar. A great feast is being celebrated here as the High Mass reveals. The world has literally collapsed, but the calendar of the Church year mandates this feast. It is celebrated wholly regardless of the circumstances of the times. These circumstances, as disastrous as they are, retreat for the duration of the liturgical feast. In a unique way, my photograph captures the collapse of two dimensions of time: the horrors of war (who knows in what way the five men in this document have been affected, who of them have lost relatives and homes?) and at the same time an exit from this time. It is an exit from the merciless power of their suffering, a turning away from the hopelessness of contemporaneity, not influenced by delusion, but in the awareness that the reality opened up to us by the liturgy is always present, that it perseveres, as if only separated from the present by a thin membrane, through all epochs of world history in one eternal Now. And this Now is entered by the partakers of the Mass through the portal of the 42nd Psalm, which is about thediscernatio between the supplicant and the “gens non sancta.” Through this distinction, the people, all of whom belong to the gens non sancta, become a holy people for the duration of the liturgy; the actual circumstances of their existence, whether the horrors of destruction or the self-sufficient satiety of peace-time, dissolve at this boundary crossed in the liturgy. The focus of the celebrants on the cross and the altar denotes a simultaneous turning-away. Standing in a row, they are like a procession that has come to a halt – come to a halt because it has attained its highest possible objective on earth.